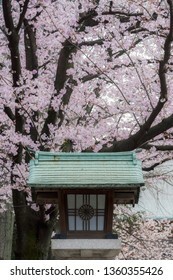 Born in 1980, photographer based in Tokyo. 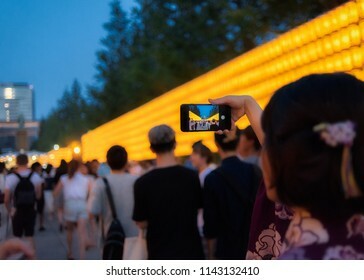 46 stockfoto‘s, -vectoren en -illustraties zijn rechtenvrij beschikbaar. 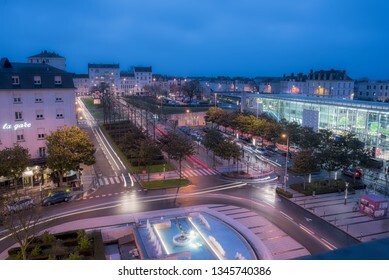 Angers, Maine-et-Loire / France - December 24th 2018: Night view of the front of the Station of Angers main city of Anjou area in France. 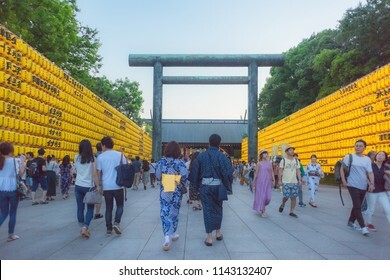 Chiyoda, Tokyo / Japan - July 15th 2018: A couple wearing japanese kimono traditional clothes at the Mitama Matsuri festival in summer at the shinto shrine Yasukuni Jinja in Tokyo. 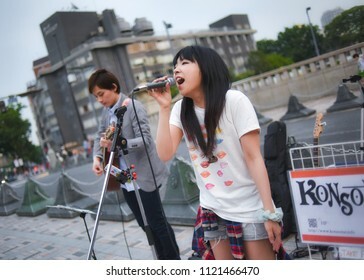 Shibuya, Tokyo / Japan - May 1st 2016: In front of the Meiji-Jingu Shrine and close from the Harajuku Station, two musician from the band called Konsome play Japanese Pop music in the streets. 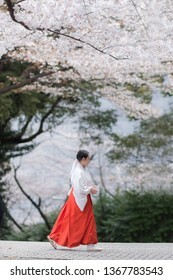 Tokyo, Japan - 2019 April 2nd: A Miko (a shrine maiden, supplementary priestess) walking under the Cherry blossoms in a Japanese Shintoist Shrine in the background by a sunny day. 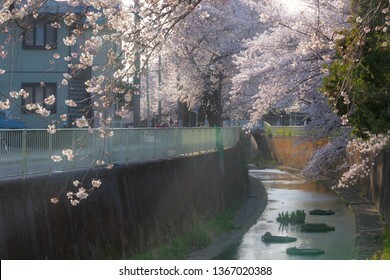 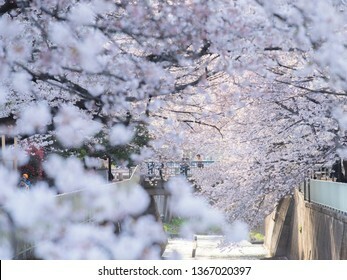 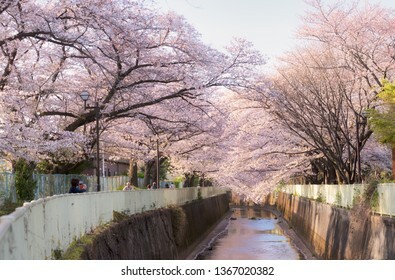 Tokyo, Japan - 2019 April 5th: Japanese people enjoy hanami, hanging-out and walking surrounded by Cherry blossoms. 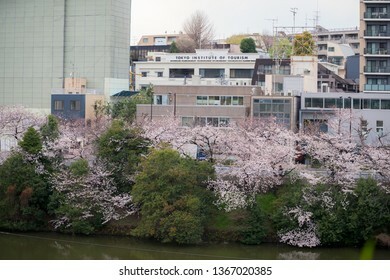 Tokyo, Japan - 2019 April 2nd: Tokyo Institute of Tourism and the Cherry Blossom trees and flowers Sakura in Tokyo. 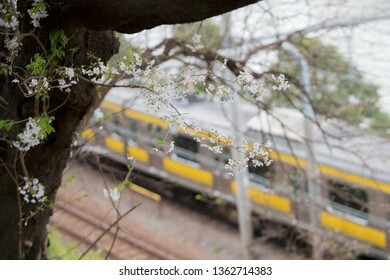 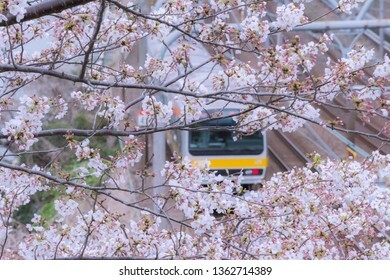 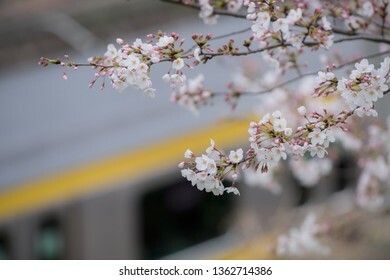 Tokyo, Japan - 2019 April 2nd: Japan Rail train and the Cherry Blossom trees and flowers Sakura in Tokyo. 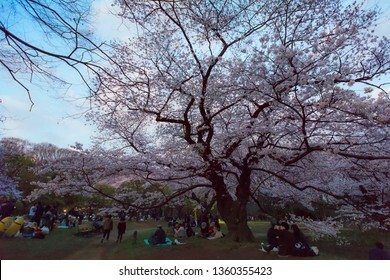 Yoyogi, Tokyo / Japan - March 31st 2019: Japanese people and tourists enjoying the hanami season in Yoyogi Park in Tokyo, dringink under the cherry blossom trees. 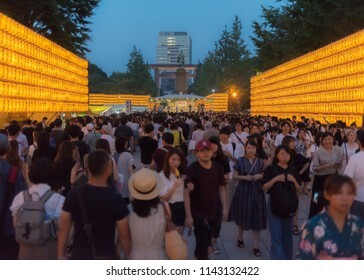 Tokyo, Japan - April 4th 2019: Entrance of Hie Shrine with the traditional lantern with imperial sign and the sakura cherry blossoms. 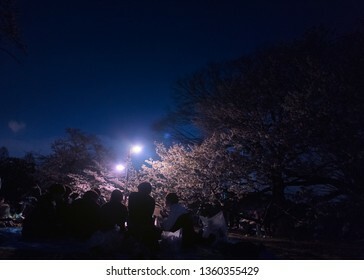 Yoyogi, Tokyo / Japan - March 31st 2019: Japanese people and tourists enjoying the hanami season in Yoyogi Park by night in Tokyo, dringink under the cherry blossom trees. 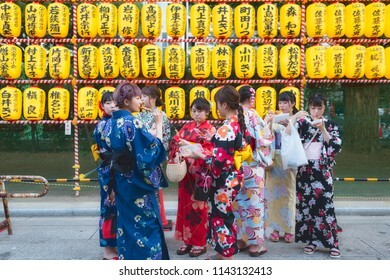 Chiyoda, Tokyo / Japan - July 15th 2018: Group of Japanese girls wearing traditional kimono at the Mitama Matsuri festival in summer at the shinto shrine Yasukuni Jinja in Tokyo. 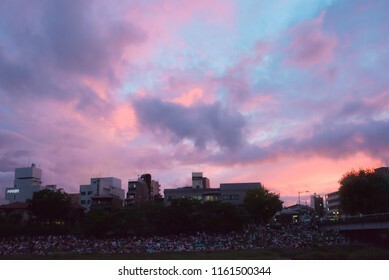 Nakagyo Ward, Kyoto / Japan - August 16th 2018: Demachiyanagi Station,at Nakagyo and Kamigyo Ward, the audience coming to see the Gozan no Okuribi Daimonji, a Mountain in fire to close Obon period. 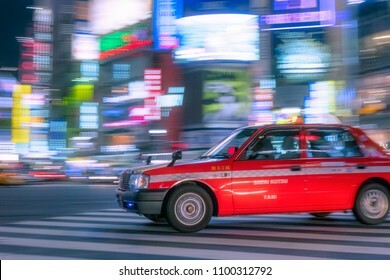 Shibuya, Tokyo / Japan - April 30th 2017 : Japanese panning taxi traffic in motion blur by night with vivid and colourful lights and light-trails in the background. 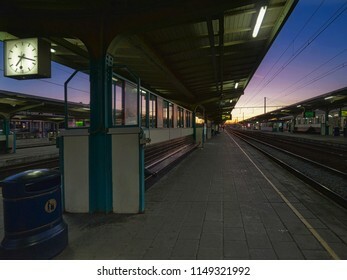 Kortrijk, West Flanders / Belgium - October 15th 2011: 19h20 at the Kortrijk Station view from the platform by sunset, typical Flanders Belgium Station. 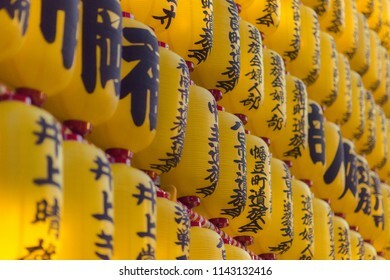 Chiyoda, Tokyo / Japan - July 15th 2018: The famous yellow lanterns showing the sponsors of the Mitama Matsuri festival in summer at the shinto shrine Yasukuni Jinja in Tokyo. 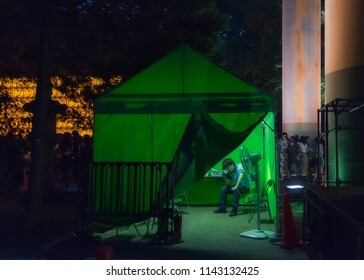 Chiyoda, Tokyo / Japan - July 15th 2018: Green tent and an organisation staff at the Mitama Matsuri festival in summer at the shinto shrine Yasukuni Jinja in Tokyo. 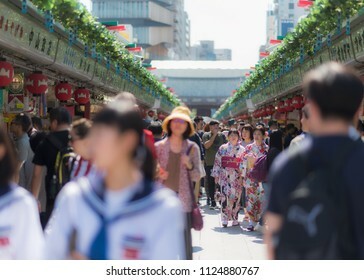 Taitō, Tokyo / Japan - September 29th 2017: Japanese and tourists visit Nakamise-dori shopping street at Senso-ji Temple in Tokyo, the oldest Buddhist temple of Tokyo located in Asakusa. 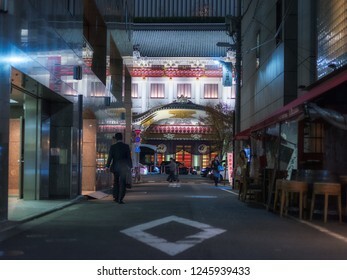 Ginza Chūō, Tokyo / Japan - November 30th 2018: The front of the Kabuki za Traditional theater from one of the back alleys of Ginza by night in Tokyo, Japan. 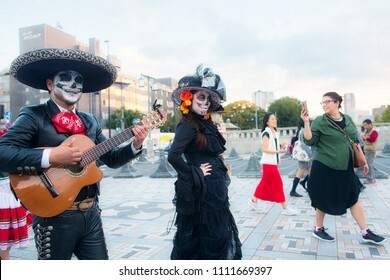 Shibuya, Tokyo / Japan - November 2nd 2017 : Day of the Dead (Día de Muertos) is celebrated by Mexican diaspora in Tokyo, here in the Harajuku district near the Meiji-Jingu Shrine. 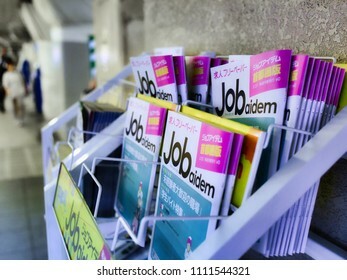 Minato-ku, Tokyo / Japan - May 24th 2016 : It's full employment period in Japan, some job offer magazines alone in a train station in Shimbashi. 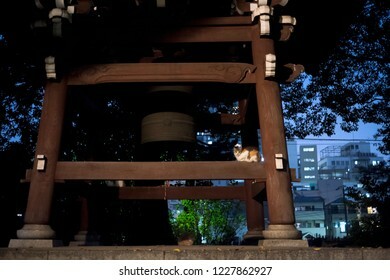 Toshima-Ku, Tokyo / Japan - November 9th 2018: A cat sit near the Buddhist bell of the Ikosanhomyoji Temple in Ikebukuro by night. 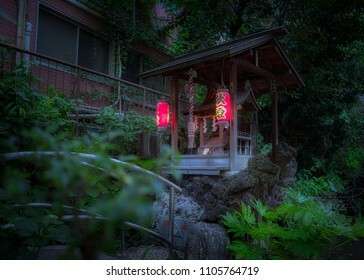 Shinjuku, Tokyo / Japan - May 8th 2018 : Night view of the Tsunokami Benzaiten shrine at the Mouchi no Ike sacred shinto shrine. 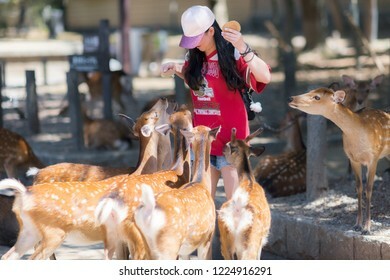 Nara / Japan - August 17th 2018: Young woman is feeding deer crackers (Shika-senbei) to a crowd of playful deer in Nara park. 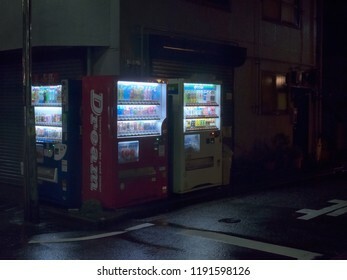 Shibuya, Tokyo / Japan - September 27th 2018: Vending machines by a rainy night in Shibuya, Fudodori Hatsudai in Tokyo. 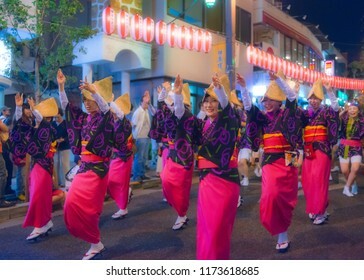 Kagurazaka, Tokyo / Japan - July 25th 2014: Awaodori Festival in Kagurazaka, dancers perform the traditional dance of Awa-Odori by night in the streets. 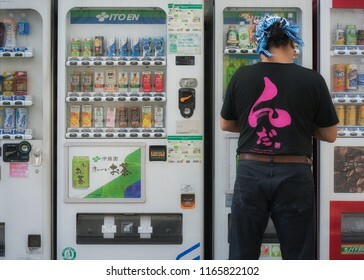 Taitō, Tokyo / Japan - August 21st 2018: Vending machines in Yanaka Ginza, a Japanese man is buying drinks and wear a teeshirt making the promotion of the North of Japan Tohoku region dialect. 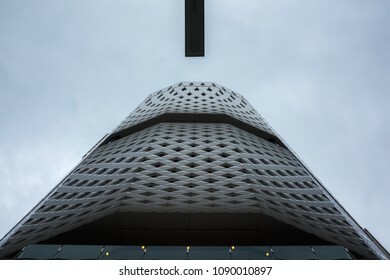 Rambures City, Somme / France - June 17th 2009: View from the entrance of the Rambures Castle, front view of the building. 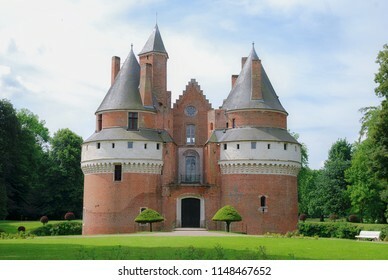 This Castle build in bricks during middle age, France. 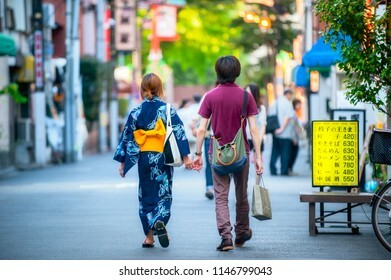 Tokyo, Kanto / Japan - July 3rd 2014: A couple is walking in the streets of Asakusa wearing traditional Japanese Kimono in summer 2014. 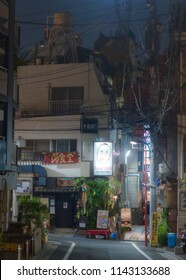 Shinjuku, Tokyo / Japan - July 15th 2018: Arakicho is a hidden gem in the center of Tokyo, like a village with original bars and typical restaurants. 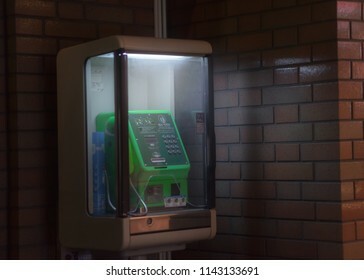 Shinjuku, Tokyo / Japan - July 15th 2018: Telephone box by night in the Arakicho area in Shinjuku. 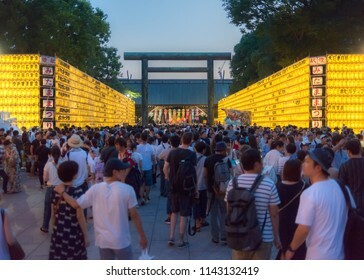 Chiyoda, Tokyo / Japan - July 15th 2018: at the Mitama Matsuri festival in summer at the shinto shrine Yasukuni Jinja in Tokyo. 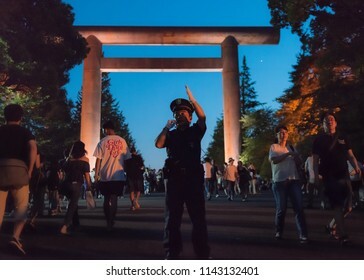 Chiyoda, Tokyo / Japan - July 15th 2018: A policeman ensure security at the Mitama Matsuri festival in summer at the shinto shrine Yasukuni Jinja in Tokyo. 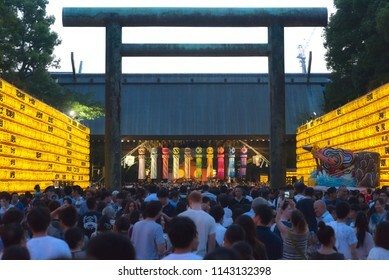 Chiyoda, Tokyo / Japan - July 15th 2018: The Mitama Matsuri festival in summer at the shinto shrine Yasukuni Jinja in Tokyo. 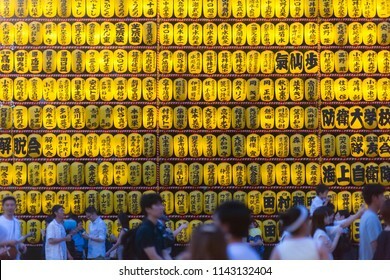 Chiyoda, Tokyo / Japan - July 15th 2018: A girl wearing Kimono take a picture at the Mitama Matsuri festival in summer at the shinto shrine Yasukuni Jinja in Tokyo. 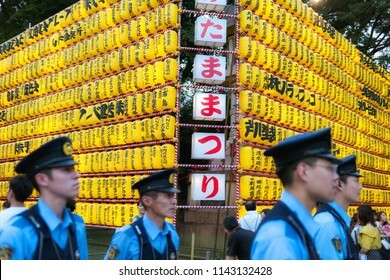 Chiyoda, Tokyo / Japan - July 15th 2018: Policemen take car that everything is safe during the Mitama Matsuri festival in summer at the shinto shrine Yasukuni Jinja in Tokyo. 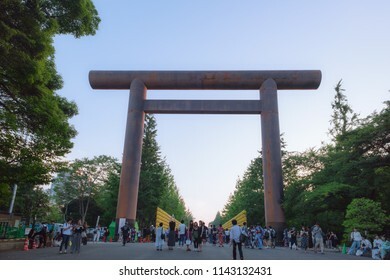 Chiyoda, Tokyo / Japan - July 15th 2018: The great Torii at the Mitama Matsuri festival in summer at the shinto shrine Yasukuni Jinja in Tokyo. 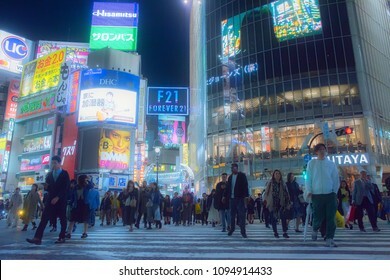 Shibuya, Tokyo, Japan - May 10th 2018: Crowd of people on famous tourist destination Shibuya crossing in Tokyo at night. 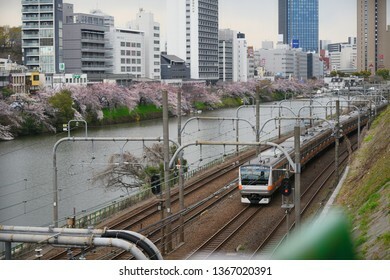 Tokyo, Japan May 7th 2018, at 12:00, View of the Nissan building from the Ginza crossing in Tokyo.